I usually try to meet up with Mr. QLI whenever I'm in Beijing, and this time I relied once again on his knowledge of local restaurants for our dinner together. Having had Chinese food when we met for the last couple of times in Beijing, he decided it was time to introduce me to what he feels is the best "Western" restaurant in town at the moment. The Georg is part of Georg Jensen Hus, one of the new luxury courtyard houses (四合院) that have been built along the banks of the historic canal known as Jade River (玉河). 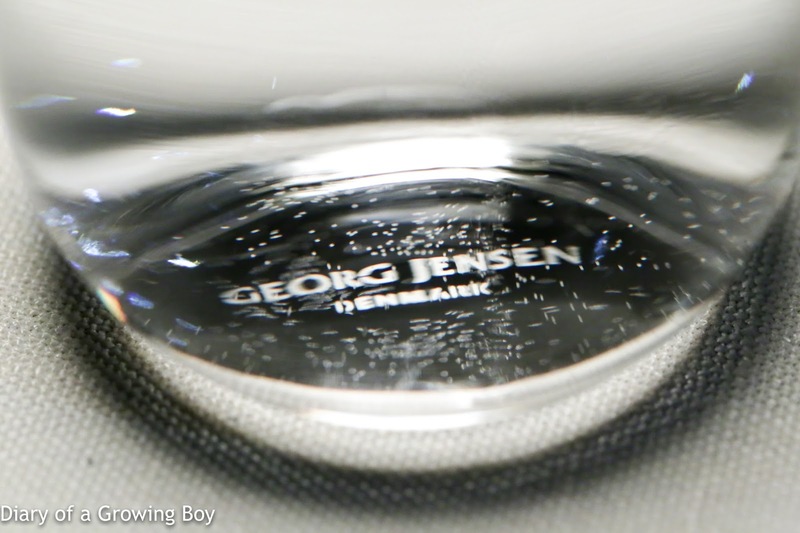 As one might infer from the name, it is owned and run by the Danish brand Georg Jensen. The space retains the charm which emanates from the classical architecture style, but the large windows and modern lighting add an unmistakable contemporary feel. 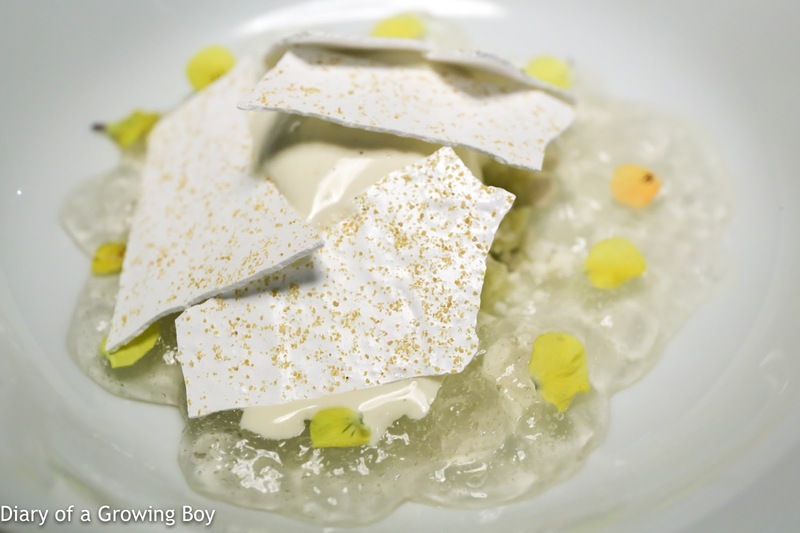 Not surprisingly, the cuisine is said to have a Nordic touch. Since Mr. QLI is a VVIP here, I left all the arrangements up to him... and we ended up having the kitchen set us up with their tasting menu. 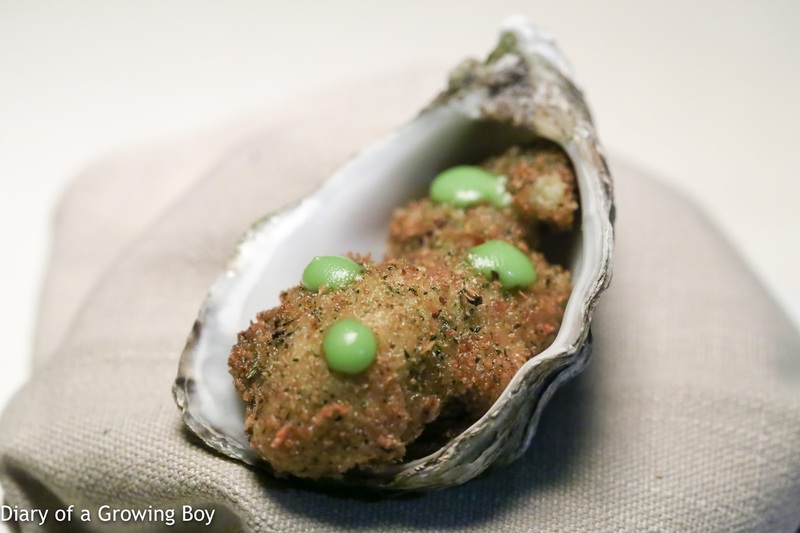 Deep-fried oyster - with parsley cream on top. Slightly saltier than expected, but tasty nonetheless. 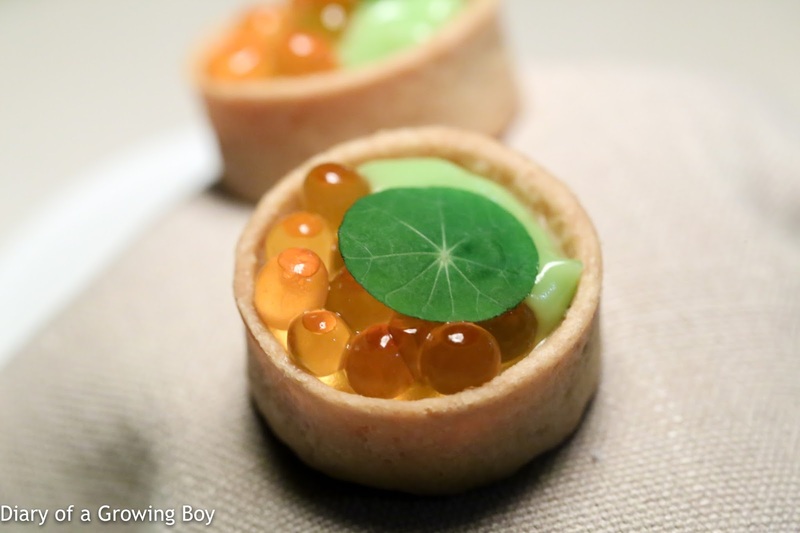 Salmon roe tart - with egg custard and parsley cream. 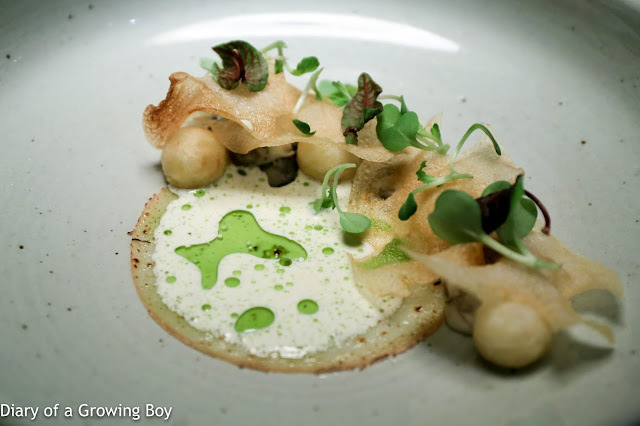 Oyster, potato, Tête de Moine - the oysters were served slightly warm, with crispy potato balls and potato chips. Served with a thin layer of flambé Tête de Moine covered with cream and leek oil. A warm and comforting dish for the cold weather. 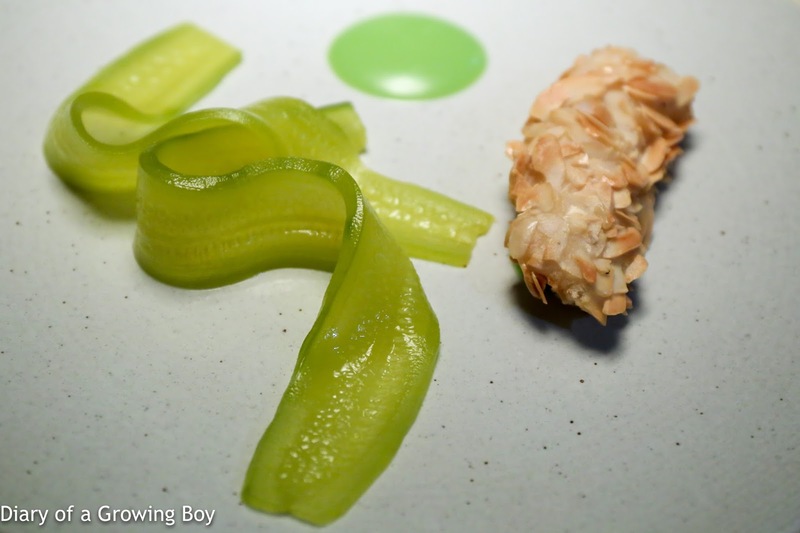 Langoustine, almonds, cucumber - the almond encrusted langoustine was pretty tasty. The curry-pickled cucumbers, though, were a surprise. The acidity there was pungent enough that one could smell it; sharp but not overpowering on the palate. As Mr. QLI remarked, this presentation style - with the twisting cucumber slices, the dot of parsley emulsion... is just sooooo Nordic. 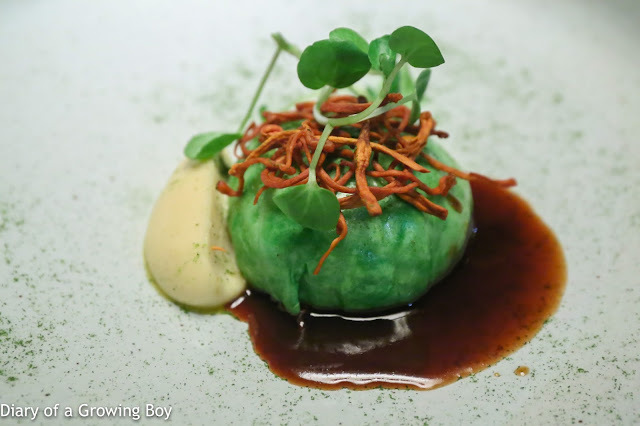 Foie gras, celeriac, cordycep flowers - the foie gras "dumpling" came wrapped in cabbage, with a whole chunk of foie inside. Topped with cordyceps mushrooms and served with celeriac purée along with what the chef called "meat sauce"... Sprinkled with leek powder. 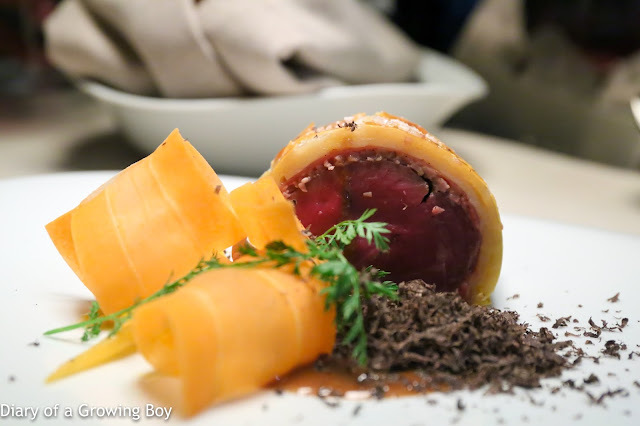 Beef Wellington, smoked carrot, truffle - the truffle shaved with a Microplane was nice and fragrant, and was a welcome addition to the tender, if rather bland, beef. Of course the foie gras sauce helped, too. The smokiness in the carrots was a nice touch. 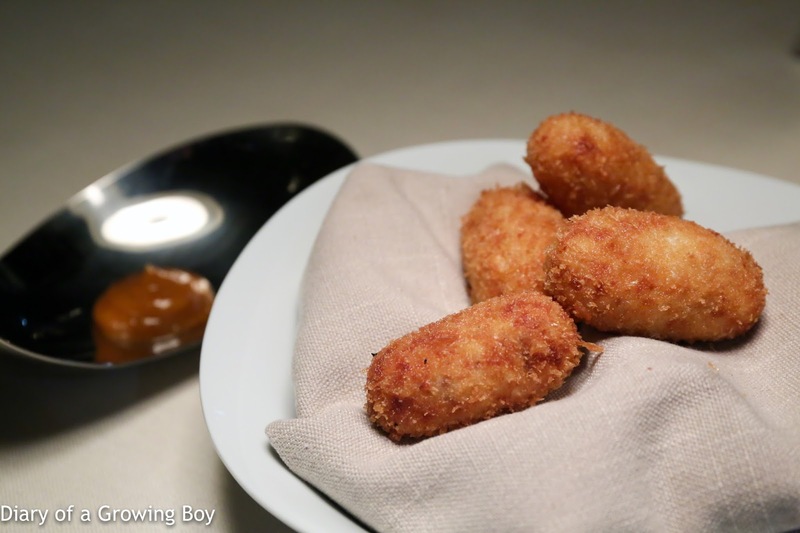 Croquetas - apparently Mr. QLI once complained that he was still hungry after a meal here, and asked the kitchen for some croquetas. So now they serve these to him every time he's here. Pretty nice and creamy, and I'm not sure the kimchi dip was even needed. 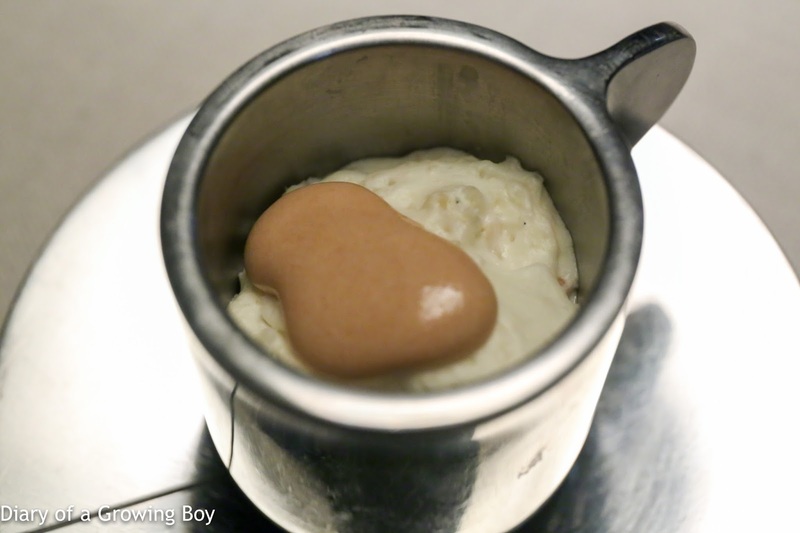 Risalamande - this Danish rice pudding with almonds is meant for the festive Christmas season, but I guess the restaurant kept it on the menu for a little longer... Came with blueberry sauce at the bottom and a caramel sauce on top. Yummy. Gin and tonic - I haven't seen a deconstructed gin and tonic dessert since I was at Akelarre 10 years ago. This was a juniper ice cream with tonic jelly and some lemon and lime. I'm not a huge fan of the cocktail, but this definitely got all the elements! Devaux Grande Réserve - nice and ripe on the nose, with yeasty notes. 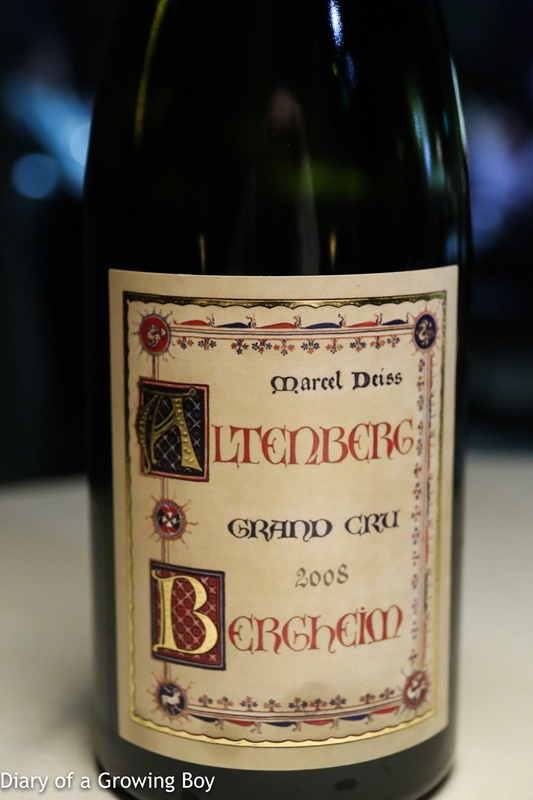 2008 Marcel Deiss L'Altenberg de Bergheim - big nose of petrol at first, and very sweet on the nose with honey and marmalade, along with some straw. Ripe and sweet on the palate but falls far short of a dessert wine - more like an auslese. 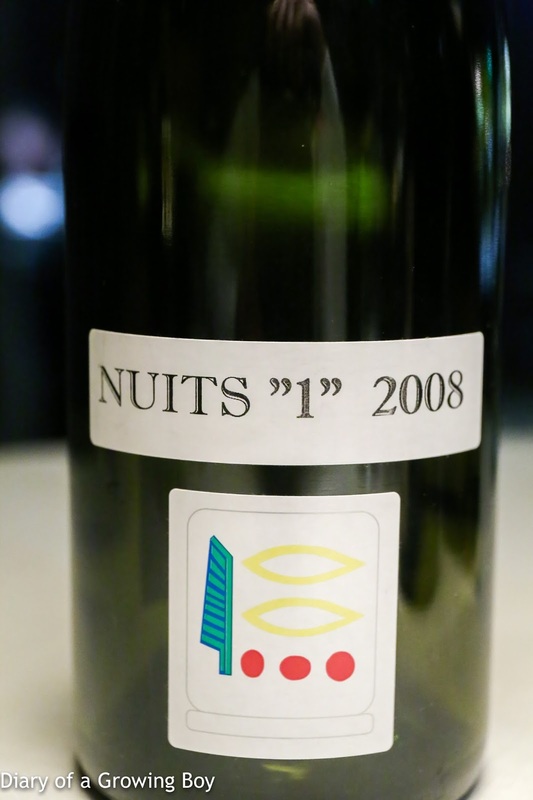 2008 Prieuré Roch Nuits-Saint-Georges 1er Cru - beautiful, open nose of leather and sweet fruit. A little floral, and so sweet it was almost like cotton candy or bubblegum. Always enjoyable to drink a bottle of Prieuré Roch. 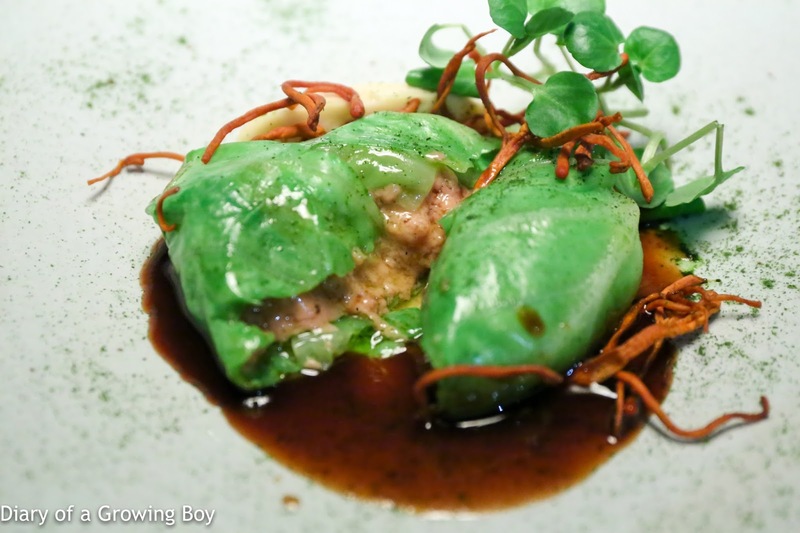 A pretty enjoyable dinner overall, and while it certainly is no comparison to the plethora of fine dining French restaurants in Hong Kong, I must admit that I was pleasantly surprised by the quality. And the price was certainly very, very reasonable for the quality. Certainly deserving of a repeat visit... and I definitely want to come back during daytime to check out the rest of the house!